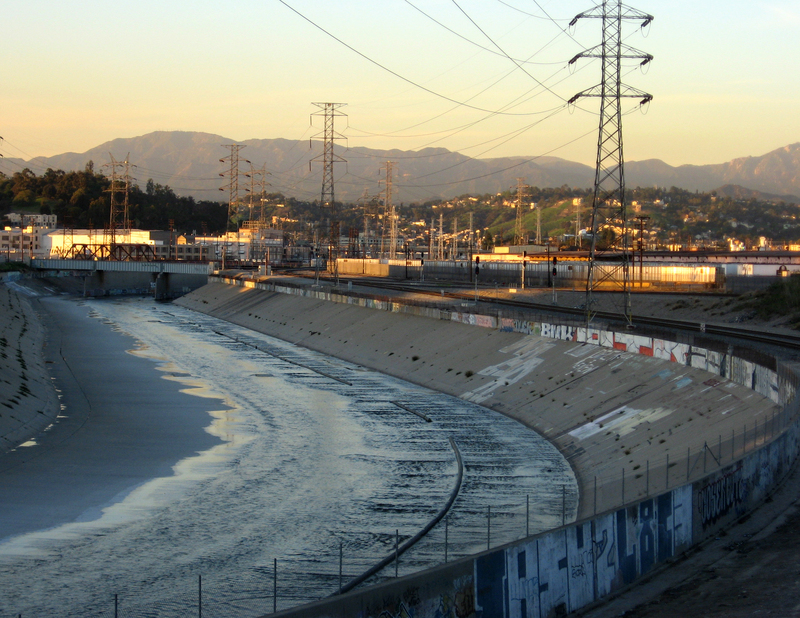 Los Angeles is a vast, complicated place, and so is its 51-mile river. While the city’s Draft L.A. River Revitalization Master Plan, outlining a transformation of the river and the areas around it, was launched back in 2007 (laid out by a team including Studio M-LA and Tetra Tech) the many cities and towns south of the city have, ten years later, finally unveiled their own, set for the largely industrial 19-mile stretch between Vernon and Downtown Long Beach. The Lower Los Angeles River Working Group, a collection of officials, non-profits, and community members launched in 2015, has laid out improvements to the river that include vegetated terraces, access ramps, dams, public art, underground water retention systems and wetlands. They’ve also called for upgrades to almost 150 nearby properties, as well as parks, streetscapes, bridges, boardwalks, viewing platforms and pathways. To paint a picture of what could be, the working group, along with Tetra Tech and Perkins + Will, have laid out close to a dozen case studies. These include a plan for the Cudahy River Park, in the city of Cudahy, calling for new bridges, access ramps, levee terracing, and riverbank green space, as well as public art installed along the river bed itself and affordable housing rising alongside the new park. About eight miles south, the Compton Creek Confluence Area would include a new green terracing along the riverbanks, a new community center, picnic stations, and even water recreation thanks to a new rubber dam and stormwater treatment plant. Things are moving quickly on the 11-mile stretch of River between Downtown L.A. and Elysian Park: dozens of parks and trails have sprung up, the U.S. Army Corps of Engineers preparing a $1 billion dollar revitalization, and AECOM wants to add 36,000 housing units. But the south L.A. working group is still identifying funding for its endeavor, from local, state and federal sources. The group is also working to curb gentrification in these vulnerable neighborhoods, which accounts for, among several plans, the increase in affordable housing, rather than market rate proposals. 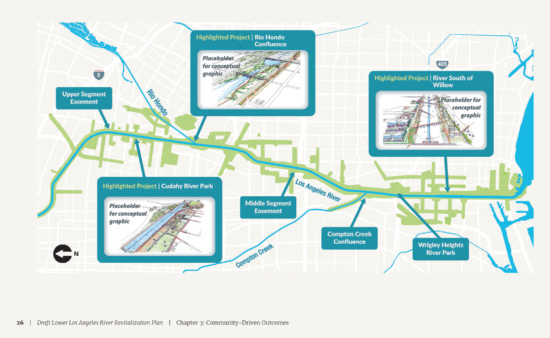 The scheme, when finalized, will be incorporated into the overall Los Angeles River Revitalization Master Plan. 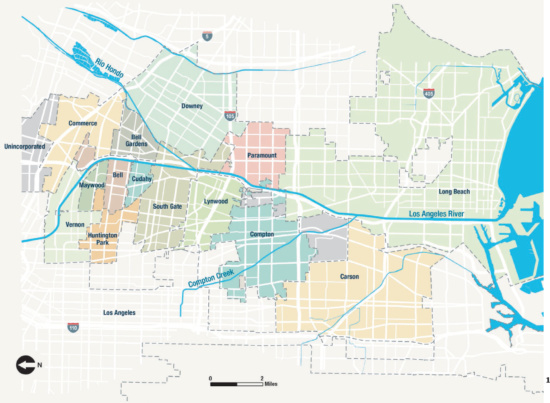 Both will likely incorporate the wide-reaching approach being developed by Frank Gehry, Olin and Geosyntec on behalf of the non-profit L.A. River Revitalization Corp, or River LA. It could be decades before the changes are completed, but if you look at the many small projects already completed further north, it’s clear substantial progress could take place in the next couple of years.